New York : G. P. Putnam&apos;s Sons, 2015. 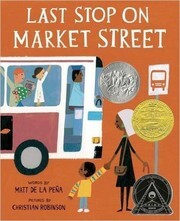 Last stop on Market Street / by Matt de la Pena; illustrated by Christian Robinson. 100 ME:PersonalName $a Personal name de la Pena, Matt. $c Statement of responsibility by Matt de la Pena; illustrated by Christian Robinson. 520 Summary $a Summary, etc. note A young boy rides the bus across town with his grandmother and learns to appreciate the beauty in everyday things. 650 Subj:Topic $a Topical term Buses -- Fiction. 650 Subj:Topic $a Topical term City and town life -- Fiction. 650 Subj:Topic $a Topical term African Americans -- Fiction.